Found this cute cupcake shop in SM Megamall through a friend's recommendation. Another cupcake store! Yey! We just came from an out-of-town trip that day and we were itching to have our sweets craving satisfied so we each bought a box of 6 and tried out some while lounging at a nearby coffee shop. 1. White chocolate with basil. This is my favorite out of the bunch. I was really surprised with the flavors and I didn't expect I'd like it more than the others. 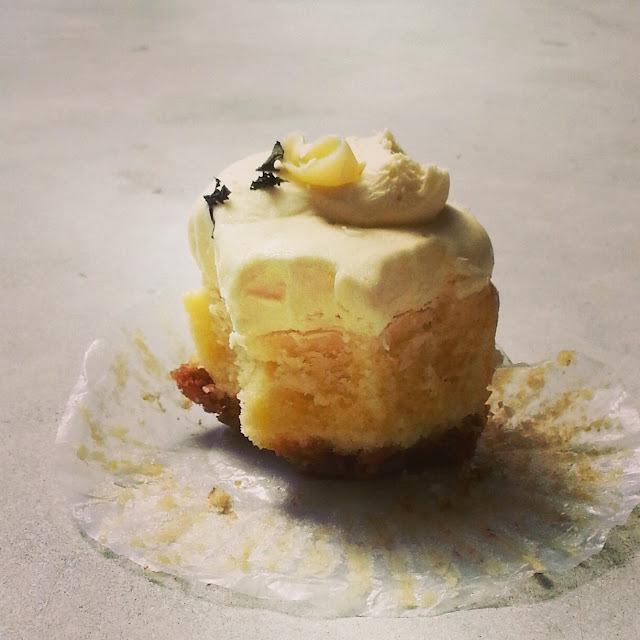 The bottom of the cupcake is actually a sort of graham crust with basil. It was a complete surprise to the palate and the combination of the sweetness of the white chocolate and the savory flavor of basil definitely won my heart. 2. Red Velvet. I was not a big fan of J.Cuppacakes' version of this cupcake classic. Though I read online that most people love this flavor, I was not impressed. I thought the cake was dry and crumbly, and I hope they do make the color more red as opposed to it's current dark shade. 3. Salted Caramel. Salted caramel flavor is indeed a fad in most restaurants, dairy products, coffee shops and pastries. Ever since I had a taste of an ice cream in this flavor, I've been wanting more! Okay, so this is my second favorite flavor. One issue I had with it is the popcorn on top. Maybe since the cupcake was refrigerated too long, the popcorn had turned chewy and lost all its crisp. What won me over is the caramel filled center! Another surprise there! 4. Vanilla. We all know that this is a staple flavor in almost everything so more often than not, we assume that this would be perfected. I was quickly attracted with the bright pink color but it fell short of my expectations. I think the frosting-cake ratio was off, there was too much frosting on top of the cake. The sweetness was quite overpowering but props for the moist cake. Another craving satisfied, another cupcake shop visited! They also make customized cakes, cupcakes and cake pops. 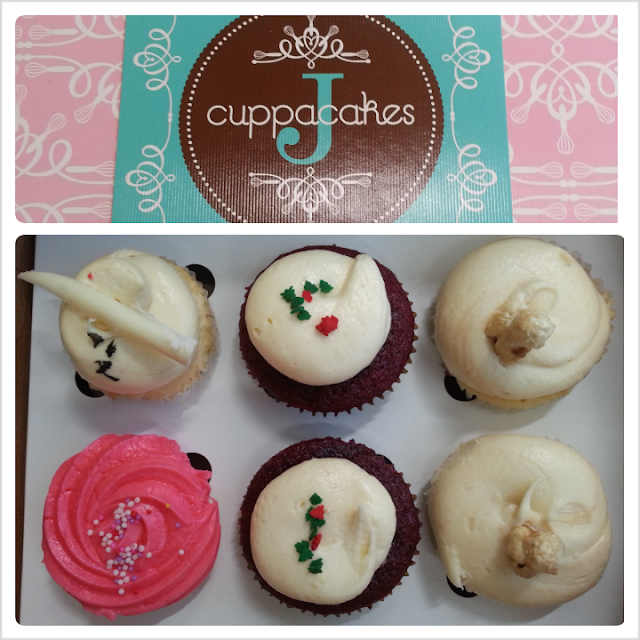 You may visit J.Cuppacakes' stall at 2F SM Megamall B (in front of the department store), Mandaluyong, Metro Manila.